Efficiency, convenience, and automation are the three words that define everything the Internet of Things (IoT) stands for. Today, IoT has become a game changer technology that has been creating quite a buzz in almost every industry. But has this technology found acceptance in healthcare? The modest beginning of IoT in healthcare can be traced to the use of smart sensors, remote monitoring, and medical device integration as well as wearable biometric sensors, activity trackers, glucose monitors, smart beds and medication dispensers. Additionally, the use of IoT in healthcare will help mitigate pharmaceutical supply chain entropy, while improving transparency and visibility. The future of healthcare will be exhilarating with more expansion and investment in IoT. This technology is expected to optimize every aspect of care as well as the pharmaceutical supply chain and transfigure the way it is managed across the continuum. So, let’s understand in detail the reasons why IoT in healthcare is the need of the hour. Quantified health is going to be the new future of healthcare because health that is measurable can be better improved. Therefore, it is advisable to take advantage of quantified health technology. Moreover, performance is affected by data; so, an accurate measurement and tracking of health for better results is one of the major reasons why we need IoT in healthcare. This is another reason why we need IoT in healthcare. By updating patients’ personal health data on the cloud and terminating the need to feed it into the electronic health records (EMRs), IoT guarantees that every minute detail is taken into consideration to make the most favorable decisions for patients. IoT in healthcare can boost patient satisfaction by optimizing surgical workflows. 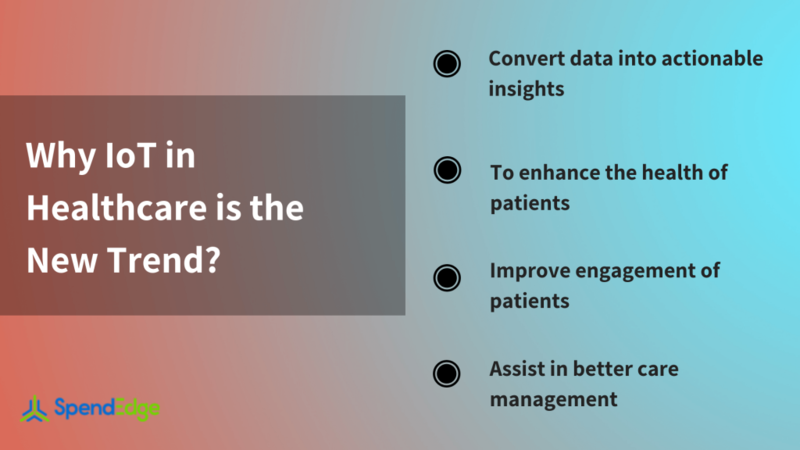 Additionally, it can also increase patient engagement by enabling patients to spend more time interacting with their doctors as it reduces the need for doctors’ appointment with the internet connected devices, delivering valuable data. IoT in healthcare can enable care teams to gather and connect millions of data points on personal fitness from wearables like sleep, heart rate, temperature, perspiration, and activity. Consequently, alerts can be sent out to patients by the sensor-fed information. This will not just immensely improve the optimization of workflow but also ensure that care management is done from the comfort of one’s home. Continue reading or to learn more about the application of IoT in healthcare by leveraging the actionable procurement insights from SpendEdge’s healthcare industry experts. Request a free demo now!